Queens has been a county since 1683. Just as the USA originally had 13 states, the state of New York had 12 original counties: Albany, Cornwall, Dukes, Dutchess, Kings, New York (Manhattan), Orange, Queens, Richmond, Suffolk, Ulster and Westchester. Nassau County, you say? It’s a Johnny-come-lately. In 1898, when four counties voted to become part of New York City, becoming Greater New York, half the county of Queens—the eastern towns of North Hempstead, Hempstead and Oyster Bay—chose to become independent, and in 1899 they created a county of their own, Nassau. Had these towns not separated from Queens, the borough’s neighborhoods might well have included Lynbrook, Long Beach, Port Washington, Oyster Bay, Massapequa… and I’d be writing till Christmas. As is, Queens is large enough. Before 1870 Western Queens consisted of three separate towns, Newtown, Flushing and Jamaica. The towns were made up of villages, like College Point and Richmond Hill, which today are mere neighborhoods that retain the old village names. In 1870 Long Island City seceded from Newtown and incorporated as a city. Many today think of Long Island City and Astoria as the same place. In a way, they are, but Astoria’s only a part of what was once greater Long Island City, which consisted of today’s Astoria, Ravenswood, Hunters Point, Dutch Kills, Blissville and Sunnyside, all of which will be discussed here. The above is one of the remaining eclectic mansions in Astoria Village’s 12th St. Astoria’s pedigree dates to the mid-1600s, when William Hallett received a grant for the area surrounding what is now Hallett’s Cove by New Netherland director general Peter Stuyvesant. However, the oldest structures in the region date to the mid-1800s, after fur merchant Stephen Ailing Halsey incorporated the village in 1839. Astoria was named for a man who apparently never set foot in it. A bitter battle for naming the village was finally won by supporters and friends of John Jacob Astor (1763-1848). Astor, entrepreneur and real estate tycoon, had become the wealthiest man in America by 1840, with a net worth of over $40 million. While he may never have visited the Long Island village that bore his name, he did have a view of it from his summer home, built on what is now E. 87th St. near York Ave. Wealthy businessmen built homes on what are now 12th and 14th Sts., some cozy Italianate boxes like the one in the photo, others large, ornate mansions. Sadly, those that remain have been altered nearly beyond recognition. Hallett’s Cove, the region in Astoria just south of Astoria Park and west of 21st St., is today a mixture of breathtaking houses, ancient churches and graveyards, as well as forbidding, utilitarian housing projects and industrial buildings. The area near Astoria Park, and Ditmars to the north, feature views of the Hell Gate (1910) and Triborough (1936) bridges. It’s typical of the resolute non-development of New York City’s waterfront that the closer to the water you get, the more boring the housing gets. Like many of New York City’s neighborhoods, Ravenswood was first settled by the Dutch, when Captain Francis Fyn acquired what would later be called Roosevelt Island and the strip of land facing it across the East River in 1651. That island’s namesake for decades was Robert Blackwell; his mansion on the former Blackwell’s Island still stands. A group of impressive mansions was arrayed on Vernon Blvd. (neé Ave.) in the mid-1800s, none of which remain today. The area came into its own as a residential neighborhood in the 19th century, but only after the city of New York bought up land in the 1840s and built orphan asylums and smallpox hospitals. In 1845, angry Astorians burned the smallpox hospital to the ground, and the asylums found a home on Blackwell’s Island. Colonel George Gibbs had acquired some waterfront property as early as 1814 and intended to create a private residential park. He died in 1833 without fully realizing his dream. It’s thought that around this time, prominent clergyman Rev. Francis Hawks proposed naming the area in honor of his friend John Ravenscroft, the Episcopal bishop of North Carolina. After it was gently suggested to the reverend that the bishop might not want his name attached to so obscure a property, Hawks changed it to Ravenswood. Gibbs’ property was sold to developers in 1848 to four prominent New York investors, who quickly began to build it up. Over time, a street grid was built and Sunswick Creek, which ran through the area, was filled in. For decades Ravenswood was home to the Sohmer Piano factory on Vernon Blvd., seen here. Sohmer, a rival to the Steinway empire located in north Astoria, relocated decades ago, but its old factory is now expensive apartment units. Hunters Point, which can be spelled with an apostrophe or without, is the southwest end of Long Island City, running from the East River to Sunnyside Yards and from 44th Dr. to the Newtown Creek. Dominie’s Hoek (Hook), originally the western end of the town of Newtown, was settled when a tract of land was awarded to Everard Bogardus, a Dutch Reformed minister (dominie), in 1643. The land was later owned by British sea captain George Hunter and by 1825 had become known as Hunter’s Point. The area began the transition from rural farmland in the 1860s, when the Long Island Rail Road built a terminal that would be its primary connection with Manhattan until the East River tunnels and Pennsylvania Station were built in 1910. In 1870 Hunters Point was incorporated along with the villages of Astoria, Blissville, Ravenswood, Dutch Kills, Middletown, Sunnyside and Bowery Bay into Long Island City. Because it’s strategically located at the East River and Newtown Creek, Hunters Point’s waterfronts became heavily industrialized in the 19th and 20th centuries. 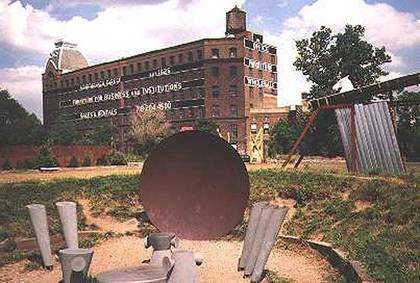 De-industrialization in the 1970s and 1980s was swift and left many rusting and rotting remnants, some of which have now been incorporated into the recreational and residential sites now rapidly springing up at water’s edge. 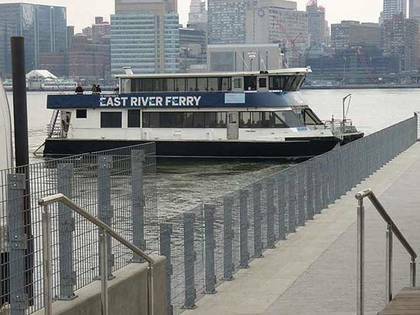 Accommodating them is the new East River Ferry landing at the foot of Borden Ave. near 2nd St. shown here. The Bragaw family, French Huguenot settlers who purchased the land from the Dutch in 1713, named their estate “Sunnyside Hill” because the property afforded them breathtaking views of the sunrises and sunsets. Sunnyside Hill and other area farms were occupied by British forces during the Revolutionary War. It was the “Sunnyside Hotel,” built nearby, that started the development of present-day Sunnyside, Queens. Named after the adjacent farm, the hotel opened in the 1840s near what would be Webster and Jackson Aves. (now 37th Ave. and Northern Blvd.). Its clientele was mainly visitors to nearby cemeteries. From 1854 to 1866, it also catered to patrons of the National Race Course in Corona (renamed “Fashion Race Track” in 1856). Sunnyside extends from the Sunnyside Railroad Yards along Skillman Ave. in the north to the Queens-Midtown Expressway in the south between 30th and about 58th Sts. Originally slower to develop than its immediate neighbors, Long Island City and Astoria, Sunnyside was transformed into a bustling residential neighborhood by the opening of the Queensboro Bridge and then the IRT Flushing Line along Queens Blvd. Not many neighborhoods are marked by their very own illuminated arch, but Sunnyside can claim one, here at Queens Blvd. and 46th St.
Blissville is the small wedge of Queens positioned between Newtown Creek, Calvary Cemetery and the Queens-Midtown Expressway. While its name may evoke a desire of its settlers to possibly be a cheerful, Elysian region, the reason for the name is more prosaic. It takes its name from Neziah Bliss, an inventor, shipbuilder and industrialist who owned most of the land in the 1830s and 1840s. Bliss, a protégé of Robert Fulton, was an early steamboat pioneer and owned companies in Philadelphia and Cincinnati. After he settled in Manhattan in 1827, his Novelty Iron Works supplied steamboat engines for area vessels. 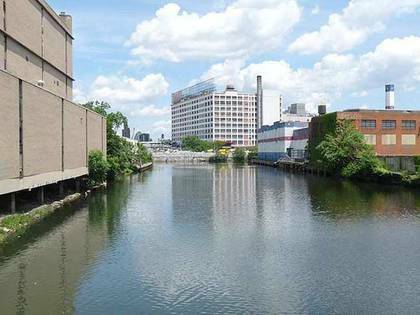 By 1832 he had acquired acreage on both sides of Newtown Creek, in Greenpoint and what would become the southern edge of Long Island City. Bliss laid out streets in Greenpoint to facilitate the riverside shipbuilding concern and built a turnpike connecting it with Astoria. He also instituted ferry service with Manhattan. Though most of Bliss’ activity was centered in Greenpoint, he’s remembered chiefly by Blissville and by a stop on the Flushing Line subway (the No. 7) that bears his family name; 46th St. was originally known as Bliss St.
Blissville has been connected to Greenpoint, Brooklyn, by a variety of bridges. In the 1800s, Penny Bridge, a simple truss bridge named for its fare of one cent, spanned Newtown Creek between Meeker and Review Aves. 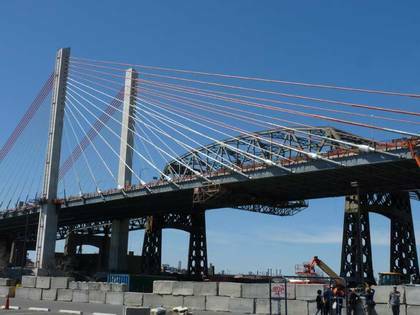 In 1939 it was replaced by the massive Kosciuszko Bridge, which itself was supplanted in 2017 by the new cable-stayed Kosciuszko. This shot from the spring of 2017 shows new and old; the old K has since been razed, with the second span of the new K due to replace it in 2020. Kevin Walsh is the webmaster of Forgotten New York, author of the book Forgotten New York and with the Greater Astoria Historical Society, Forgotten Queens.